Don’t miss our next event to raise funds for those facing the crisis of being evicted. 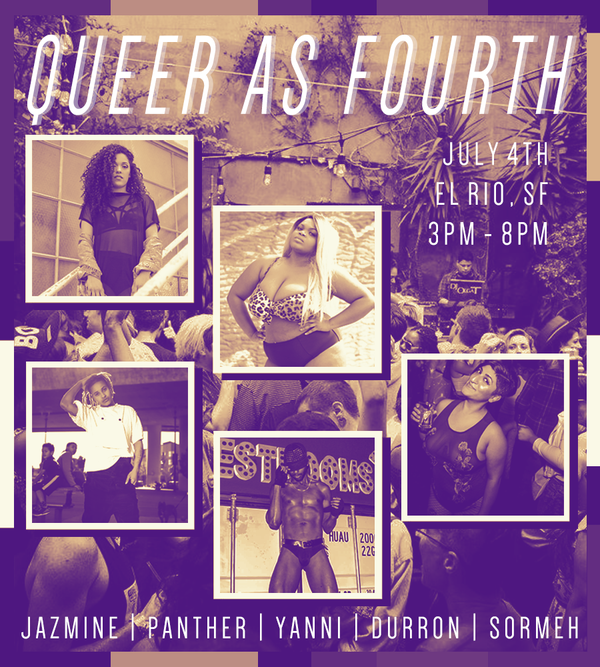 We are thrilled to announce the Fourth Annual Queer as Fourth. 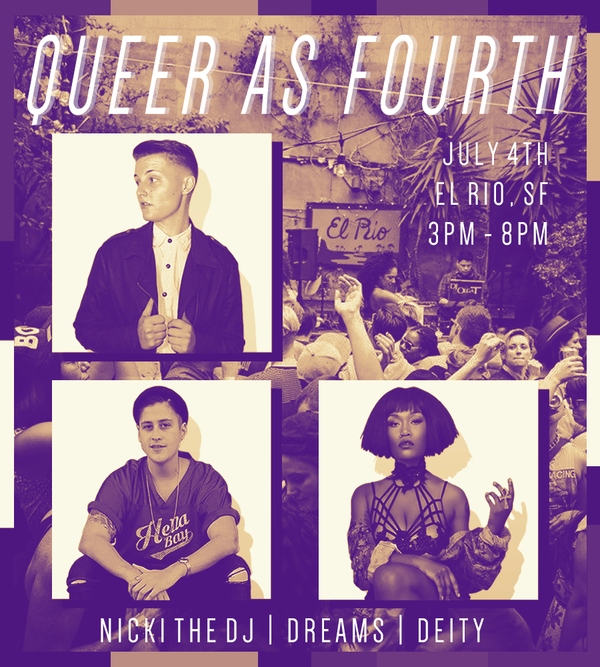 As always, it will take place on the Fourth of July at El Rio. 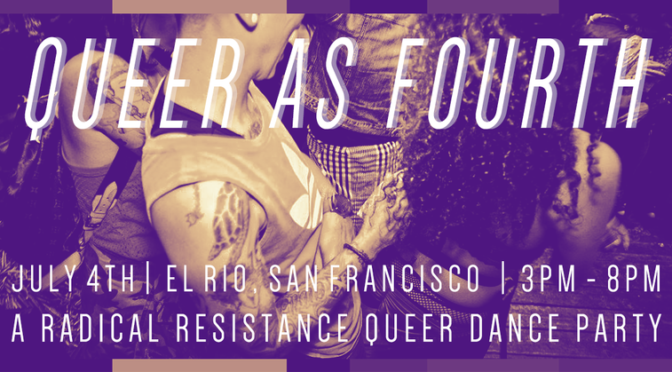 Why is This Event A Radical Resistance Queer Dance Party? Queer as Fourth is about reinventing July 4th into something that we can be proud of. Quite honestly, we are less than pleased about the current political climate. We are here for queers and their allies to come together to recognize, discuss, and be the radical change that needs to happen in this country. We are also here to dance & have a good time with the community. Have a T-shirt with a powerful message in regards to the resistance? Wear it. Have something you would like to say to the group? Let us know. We are open to ideas, suggestions, and questions that can enhance the healing power of this gathering. In lieu of the national anthem, we will have a QPOC speaker discussing the topic of radical self-love in our social climate, as an act of resistance. The Mission of Make Your Rent Event Management, Inc. is to provide charitable fundraising services to aid those qualified applicants in need of rental assistance or mortgage assistance by hosting events for the general public to participate in and enjoy. Why do we choose this non-profit? The housing crisis and the affordability to survive is progressively getting worse in the bay area and this non-profit is helping prevent folks from becoming homeless by offering rental assistance from the proceeds of the event to aid qualified applicants. SEXISM, RACISM, HOMOPHOBIA, FAT PHOBIA, TRANSPHOBIA, ISLAMAPHOBIA, AGEISM, ABLEISM, OR HATEFULNESS. If you can, please leave a review of an event you’ve hosted or attended on MYREM’s FaceBook page. That would be so awesome of you! “MYREM puts on a fundraiser like no other. Dr. Melton and her team hosted “Booze and Benevolence” at my bar, Radio, in downtown Oakland, to help folks in need with their housing costs. The event felt like a great party that just happened to be accomplishing something wonderful in the process. Click here to read more about the history of MYREM, Inc.
What is a 501(c)3 ? A 501(c)3 status corporation is organized and operated exclusively for charitable purposes. As a result they are granted an exemption from having to be obligated to pay taxes to the Internal Revenue Service (IRS). In addition, United States Code section 170, provides a deduction, for federal income tax purposes, for some donors who make charitable contributions to most types of 501(c)(3) organizations, among others. Regulations specify which such deductions must be verifiable to be allowed (e.g., receipts for donations over $250). applicants in our community AND guarantees a fun time for all.